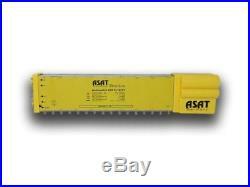 ASAT Germany Silverline Mains Powered 5 x 16 Satellite & Terrestrial Multiswitch. Multi-switch with 5 inputs 4 x SAT, 1 x terr. For the signal distribution to 16 subscribers. The terrestrial signal can be fed in as well. Suitable for Quattro LNB`s. With built-in power supply High isolation (decoupling) Integrated tilt (SAT) to compensate for the higher cable attenuation at high frequencies and thus linear levels at the receiver input High input level (SAT) through SAT amplifier at the receiver output Switchable active terrestrial with high gain Switching power supplies with low power consumption and high efficiency Number of inputs: 4 x SAT, 1 x terr. Receiver / subscriber outputs: 16 (F) Terr. Amplifier 47-862 MHz: YES – switchable Switching voltage selection LNB / polarity: 14.5 – 15.5V DC, 22KHz Frequency range: SAT / IF 950 – 2150 MHz, Terr. 1-4 0dB (-10dB) terr. 5-8 -1dB (-11dB) terr. 9- 12 -1dB (-11dB) terr. 13-16 -2dB (-12dB) Max. Input level: SAT / IF 95 dBV, terr. Active 90 dBV Max. Output level (EN 50083-3): SAT / IF IMA3 95 dBV, terr. Power consumption from the receiver: 40 mA Max. Power consumption internally (from power supply): 80 mA Integrated switching power supply: 12 Volt / 700 mA (short-circuit proof) Primary 230 V Primary power consumption in watts at load: 200 mA load 3.8 W 400 mA load 6.8 W 500 mA load 8.3 W Max. Remote supply voltage to LNB (s): 600 mA 12V ONLY at LNB input HH Note: Quattro-LNB typically 160-200 mA current consumption Temp. Range + usage: – 20…. + 60C / dry interiors. Launched in January 2014 we have built a reputation on delivering quality goods along with first class customer service. We care more about you the customer than we do the profit – because we can see that without you we wouldn’t exist! ValueStores is the new trading name for Value AV Ltd – What started out as an Audio-Visual Retailer has become so much more. Due to such success, online we have managed to branch in to so many more categories bringing you even more amazing products at the best prices we can manage, remember though sometimes we don’t have the time to check everyone out there and if we have been undersold try us – and let us know so we can see if we can do you a deal. Please do understand that we process your order the day it comes in and things outside of our control do happen which can sometimes prevent your order arriving within our usual 1-3 days so if you are concerned please do get in touch so we can look in to any concerns you have. Your rights to return goods are protected under the consumer contracts regulations. We work REALLY hard to make sure all of our customers are happy with everything we do we aim to make sure your item is priced competitively and that our carriers deliver your items ontime. If you have had an issue with your order and can’t feel like you can leave us 5 stars please get in touch and we will see what we can do to earn them. WHy Shop with VALUEStores? Same day dispatch when paid for by 2pm. Family Run Business who cares. Specialist in AV Equipment, Accessories & CCTV. Furniture orders by Specialist Couriers. Sign Up for our Newsletter. Get all the Latest News, Updates and Offers. The item “ASAT Germany Silverline Mains Powered 5 x 16 Satellite & Terrestrial Multiswitch” is in sale since Wednesday, July 4, 2018. This item is in the category “Sound & Vision\TV Reception & Set-Top Boxes\Satellite Multiswitchers”. The seller is “valuestoresuk” and is located in London. This item can be shipped to United Kingdom, Austria, Belgium, Bulgaria, Croatia, Cyprus, Czech republic, Denmark, Estonia, Finland, France, Germany, Greece, Hungary, Ireland, Italy, Latvia, Lithuania, Luxembourg, Malta, Netherlands, Poland, Portugal, Romania, Slovakia, Slovenia, Spain, Sweden, Australia, United States, Canada, Japan, New Zealand, China, Israel, Hong Kong, Norway, Indonesia, Malaysia, Mexico, Singapore, South Korea, Switzerland, Taiwan, Thailand, Chile.